The impact of intrinsic aging upon human peripheral blood T cell subsets remains incompletely quantified and understood. This impact must be distinguished from the influence of latent persistent microorganisms, particularly CMV, which has been associated with age-related changes in the T cell pool. In a cross-sectional cohort of 152 CMV-negative individuals, aged 21–101 y, we found that aging correlated strictly to an absolute loss of naive CD8, but not CD4, T cells but, contrary to many reports, did not lead to an increase in memory T cell numbers. The loss of naive CD8 T cells was not altered by CMV in 239 subjects (range 21–96 y), but the decline in CD4+ naive cells showed significance in CMV+ individuals. These individuals also exhibited an absolute increase in the effector/effector memory CD4+ and CD8+ cells with age. That increase was seen mainly, if not exclusively, in older subjects with elevated anti-CMV Ab titers, suggesting that efficacy of viral control over time may determine the magnitude of CMV impact upon T cell memory, and perhaps upon immune defense. These findings provide important new insights into the age-related changes in the peripheral blood pool of older adults, demonstrating that aging and CMV exert both distinct and joint influence upon blood T cell homeostasis in humans. Advanced age is associated with increased risk of sickness and death from infection. Infections by microorganisms that were not previously encountered or infections by previously encountered organisms that have the capacity for antigenic variation (e.g., influenza virus) cause disproportionate morbidity and mortality in older adults (1, 2). Moreover, those >65 exhibit diminished response to vaccination (3) and are up to 1000-fold more likely to die of vaccine-preventable infection than children (4). The key underlying cause for this increase in susceptibility to infections is believed to be the age-related decline of immune function—immune senescence. Utilizing a short-lived laboratory species (mus musculus), we and others have shown that factors such as thymic involution, decreased production of naive (N) T cells, reduction in T cell responsiveness, decline in TCR repertoire diversity, and dysregulation of the memory cell pool responding to persistent latent infections—“memory inflation”—all contribute to immunosenescence (reviewed in Refs. 5⇓–7 and references therein). Moreover, the loss of N T cells, accumulation of effector memory (EM) cells, and TCR repertoire constriction were shown to predict poor vaccine responses in aged nonhuman primates (8). Yet, factors leading to each of these disturbances and their relative contributions to immune senescence remain incompletely understood. Human CMV is a persistent herpes virus present in 60–90% of the adult population and is normally asymptomatic in immunocompetent hosts (reviewed in Refs. 9 and 10). Several studies have demonstrated that persistent infection with CMV is associated with changes in subset distribution, phenotype, and, potentially, the function of T cells in aging individuals (10, 11). Whereas numerous hypotheses were proposed and studies conducted to delineate the influence of CMV upon T cell homeostasis and function with aging (reviewed in Refs. 6, 10, and 11 and references therein), the relationship between this virus and human physiological aging remains incompletely understood, particularly as related to the absolute cellular changes induced by the virus and by age itself. In this study, we sought to specifically delineate the effect of aging from that of CMV infection upon relative and absolute changes in blood T cell subsets using a cohort of 391 adults aged 21–101 y, separated into two subgroups based upon serological CMV status. Our results highlight distinct and separate, but also interacting, roles of aging and of CMV in modulating the circulating blood T cell subsets and provide the framework for evaluation of both the impact of aging and CMV upon susceptibility to infection and for designing potential predictive biomarkers and immunomodulatory interventions to measure and increase vaccine response efficacy in older adults. This study was approved by the Institutional Review Boards at the University of Arizona and the Oregon Health and Science University. The cohort included 391 healthy community-dwelling individuals, 21–101 y of age, 152 CMV− (84 females, 68 males) and 239 CMV+ (157 females and 82 males), recruited in Oregon, Arizona, and Texas. Table I illustrates our cohort details, presenting exact numbers by age bin, entire age range, age mean, age median, gender, and CMV status, all stratified by geographic region where subjects were drawn. The cohort included 6 individuals from Texas (samples shipped in heparin overnight and then processed in Oregon). The remainder of the samples was closely split between Oregon (194) and Arizona (191), and were both processed fresh at the respective sites and also cryopreserved for future analysis. Confirmatory analysis of a smaller cohort using frozen samples (Supplemental Fig. 1) was conducted in Arizona. All individuals were recruited over the period of 6 y. Cell processing, CMV ELISA, and flow cytometry (FCM) phenotyping were performed by two technicians, in a highly standardized and reproducible manner with regard to cell viability, standard curve ELISA generation, and FCM standards. Exclusion criteria included known immunosuppressive pathology, stroke, cancer, or use of steroids within the last 5 y. Blood was drawn into heparinized Vacutainer-CPT tubes (BD Biosciences [BD], Sunnyvale, CA; catalogue 362753) and processed per manufacturer’s recommendations to isolate PBMC and plasma; Li-EDTA tubes were used to determine complete blood counts. Some PBMC were used immediately for FCM; the rest were viably cryopreserved and stored for further analysis. The presence of Abs against CMV was determined by ELISA, as previously described (12). CMV titer was determined utilizing a standard curve from a confirmed clinical positive control as the reference with a negative control cutoff of 1:30. Additionally, a clinically verified negative CMV control was run with every plate. All subcohorts were tested with the identical assay titration (including the identical positive and negative reference controls and a small group of 80 samples [40 CMV+ and 40 CMV−]) and were independently verified by a national reference laboratory (ARUP Laboratories). Freshly isolated PBMC (1–5 × 106) were stained with T cell markers (in various combinations), as follows: anti-CD3 allophycocyanin-Cy7 (BD 557832), anti-CD4 PerCP-Cy5.5 (eBioscience), anti-CD8β ECD (Beckman Coulter, Hialeah, FL; 6607123), anti-CD95 allophycocyanin (Invitrogen; MHCD9050), anti-CD28 biotin (eBioscience; 13-0289), and SA-Q-dot 525 (Invitrogen; Q10141MP). Additional surface markers (CD14-PE-Cy7, CD11a-FITC, CD62L-PE, CD16-Pacific Blue) were included in this panel to evaluate these and other cell types (NK, monocyte/Mf, etc.). Unfortunately, the consistency of CD62L staining proved to be insufficiently robust to use it in cohort analysis. Cryopreserved PBMC (1 × 106/sample) were stained with anti-CD4–A700 (eBioscience; 56-0048-82), anti-CD8β ECD, anti-CD95 allophycocyanin, and anti-CD28 PerCP-Cy5.5; in select experiments, CD3-A700, CD4-allophycocyanin e780, CD45RA-A450, CCR7-PE, and CD95-PECy7 from eBioscience, BD, and BioLegend, as well as the LIVE/DEAD Fixable Dead Cell Stain, YFR dye (L-34959; Invitrogen), were also used. FCM analysis was performed with the four-laser BD LSR II or BD Fortessa (exclusively used for analysis of cryopreserved specimens, which were all processed and analyzed in Arizona regardless of the site of their recruitment) instruments, using DiVa acquisition (BD Immunocytometry Systems, Mountain View, CA) and the FlowJo analysis software (Tree Star, Ashland, OR). All data were collected using either the same or similar four-laser configuration, as follows: 405, 488, 532 (LSR II in both Oregon and Arizona), or 561 (Fortessa, AZ), and 640 nm from the same manufacturers, set to optimized standard voltages and calibrated using Rainbow beads (BD) on a daily basis to achieve consistency. Maximal tolerated daily variation was <3% between the coefficients of variation measured by day-to-day rainbow bead controls. Absolute CD4 and CD8 T cell numbers were calculated by multiplying percentage by the total lymphocyte number determined from the whole blood counts using the Coulter counter (Beckman Coulter). Subset definitions and gating strategies are outlined in the text and/or the figure legends. The numbers of a defined subset (definitions specified in the text; e.g., N: CD28intCD95low; central memory (CM), or CM: CD28highCD95high; and effector/EM, or EM: CD28low or CD28− CD95high) for CD4 and CD8 were obtained by multiplying the numbers of CD4 or CD8 by the of the respective memory subsets. This indicator variable provides a merit of statistical hypothesis testing on not only the difference in intercept or starting subset counts (statistical hypothesis of β2 = 0) between CMV− and CMV+ but also the difference in slope or rate of change (statistical hypothesis of β3 = 0) between CMV− and CMV+. Prior to applying regression models, normality assumption was evaluated using Shapiro-Wilk test, and logarithmic transformation was applied if normality assumption was not held. To evaluate variation of CMV− and CMV+ cohort by age group, we categorized age into three age groups (age < 40, 50 ≤ age < 65, and age ≥ 65) and then performed pairwise Levene’s tests for the equal variance followed by Bonferroni correction for the multiple comparisons. Two-way ANOVA followed by pairwise comparisons was used to compare the T cell counts between age groups and CMV titer. There are three categories of CMV titer (CMV−, CMV low, and CMV high), and these were determined by the median CMV titer value 349, a titer above which was assigned CMV high, and below which was assigned CMV low, whereas a titer value of 0 was assigned CMV−. Prior to applying two-way ANOVA, normality and equal variance assumptions were evaluated using Shapiro-Wilk test and Levene’s test, respectively. Due to the unequal variance, CD8 counts were logarithmically transformed with the base 10 (log10). Bonferroni multiple comparisons correction was used to control overall levels of type I error. Correlation and Bland Altman plot was used to evaluate agreement and disagreement with any systematic bias between CD95lowCD28high and CCR7+CD45RA+ measurement. A simulation study was performed to understand cohort size effect/small sample behavior. In that simulation, we randomly select subsample size of 80 and 120 from whole cohort (n = 391), repeated regression analysis to see whether the subset analysis results reach the same conclusion. We repeated the simulation 100 times and reported false-positive rate and false-negative rate as measures of sensitivity for cohort size effect (Table II). Statistical significance was determined at the significance level of 0.05. These analyses were conducted using the SAS version 9.3 software (SAS Institute, Cary, NC). It has been long noted that the representation of circulating T cell populations changes with aging (e.g., Refs. 14⇓⇓–17, reviewed in Ref. 18). However, such changes were rarely, if ever, corroborated in large and diverse human populations around the world and were commonly described only in relative (percentages), rather than absolute (cell number), terms. Therefore, it remains unclear whether the changes in a given T cell subset were directly caused by numerical increases or decreases in that particular T cell subset, or indirectly, so that lower representation of a given subset (e.g., the N cells) could have been due not to an absolute loss of that subset, but to an absolute increase in another cell subset (e.g., one of the memory cell subsets). Most importantly, the potentially confounding impact of CMV was not properly accounted for, and the impact of this virus relative to the impact of aging itself remains unclear. Indeed, only three studies to date evaluated changes in cell numbers with aging and CMV infection (19–21), using different markers to define cell subsets, and reaching somewhat disparate conclusions. To conclusively assess the above issues, we recruited a large healthy community-dwelling cohort of CMV− (152 individuals, age range 21–101) subjects from three very different regions of North America (the U.S. states of Arizona, Oregon, and Texas) and compared them in a cross-sectional manner with 239 CMV+ subjects in the same age and geographical range group (see Table I and the Materials and Methods for a detailed cohort description). We first analyzed relative representation of different T cell populations, using CD28 and CD95 as the main discrimination markers. We elected these markers due to stable and unwavering expression of CD95 on memory cells and the informative delineation between EM and CM cells based on CD28 downregulation (22, 23). We had other markers present in the panel to evaluate additional cell subsets of T cell markers; we also initially employed CD45RA and CD11a, the addition of which to the CD28 and CD95 demarcation did not show improved resolution over the use of CD28 and CD95 alone. We therefore focused the initial analysis on these two markers. Consistent with several other reports (14, 15, 18, 24 and references therein), we confirmed that in the absence of CMV infection, the percentages of total CD8 and N CD8 (defined as CD28int95low) cells significantly decline with age, with a concomitant significant increase in the percentage of both EM (CD28low95high) and CM (CD28high95high) CD8 subsets (Fig. 1, red closed circles). By contrast, representation of total CD4 cells increased significantly (p ≤ 0.0001). 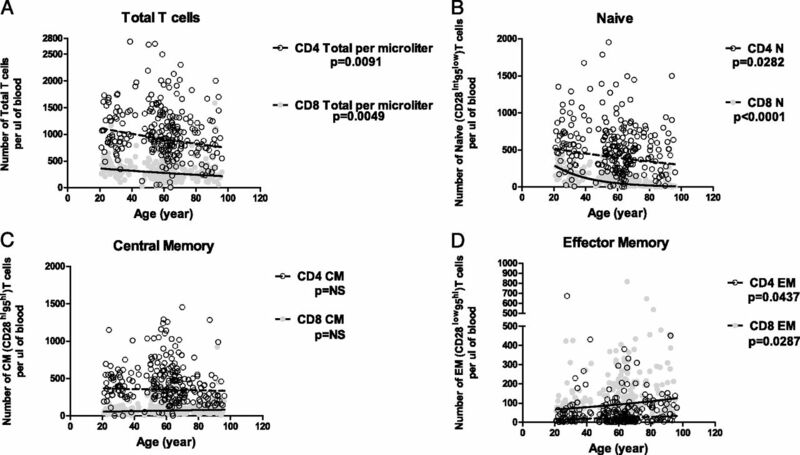 Within the CD4 pool, N and EM CD4 T cells did not exhibit statistically significant age-related changes (p values = 0.1196 and 0.5864, respectively; Supplemental Table 1); CM CD4 cells exhibited a mild relative increase with aging (p value = 0.0315; Fig. 1, green open circles). Analysis of frozen and thawed samples from the same subjects (Supplemental Fig. 1) corroborated these conclusions, establishing that the thawing process did not significantly affect representation of different T cell subsets as scored by CD28 and CD95. 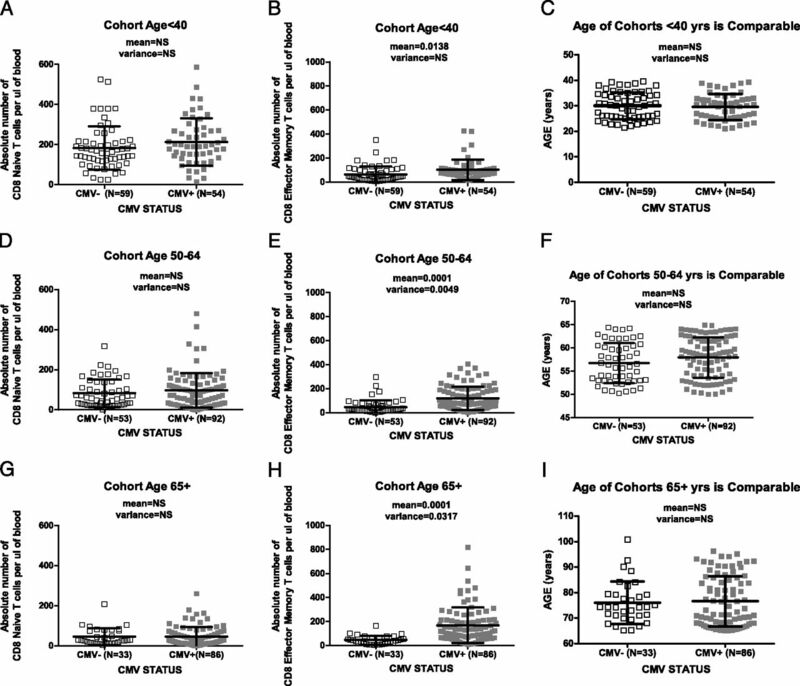 Age-related proportional alterations in CD8 but not CD4 T cell subsets in CMV− subjects. Fresh PBMC were phenotyped by multicolor FCM (see Materials and Methods). Events (≥3 × 105) were gated on lymphocytes using forward and side scatter. T cells were defined as CD3+CD4+ or CD3+CD8β+ and, within each, N, CM, and EM T cells were defined as CD28int95low, CD28high95high, and CD28low95high, respectively. Data show changes in relative representation of total (A), N (B), CM (C), and EM (D) CD8 (gray closed circles) and CD4 (black open circles) cells with aging. Data originate from n = 152 individuals, ranging in age from 21 to 101. Each dot represents an individual. The lines drawn in the figure and p values are based upon the regression parameters, as detailed in Materials and Methods and illustrated within Supplemental Table 1B. More insightful results were obtained when we examined the absolute numbers of cell subsets (Fig. 2). Overall numbers of CD4 T cells remained broadly variable but did not show consistent trends depending on age. Numbers of total CD8 T cells, by contrast, declined with age at a rate of nearly 1.7% CD8 cells/μl/year (Fig. 2A). This was almost entirely due to an absolute loss of N CD8 T cells, which in the CMV− cohort correlated directly to the age of the subject, falling from an estimated average of 200 (199.8) cells/μl at 21 y to an average of 24 (24.3) cells/μl at 80 y of age (Fig. 2B). Importantly, the increase in representation of CD8 EM and CM in CMV− subjects (see Fig. 1D) with age was only relative, representing a combination of absolute loss of the N CD8 T cells and the relatively constant or only minimally declining numbers of CD8 CM and EM cells with aging (mean levels ≤ 100 cells/μl for CM and EM cells showed little change across ages; Fig. 2C, 2D, respectively). 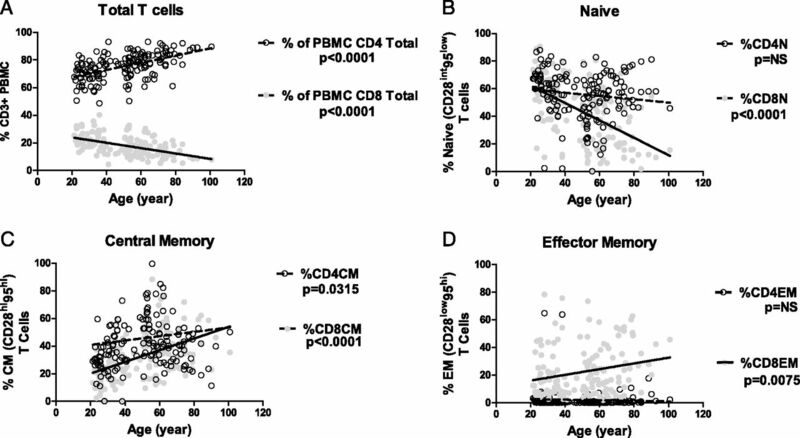 Absolute numbers of CD8 T cells and N CD8 cells decline with age in CMV− subjects. Absolute cell numbers for each subset were obtained from fresh whole blood counts and from FCM analysis of fresh PBMC, as detailed in Materials and Methods. Subject cohort, staining, gating, phenotypic definition, and statistical treatment were as in Fig. 1. Absolute numbers of total (A), N (B), CM (C), and EM (D) CD8 (gray closed circles) and CD4 (black open circles) cells are plotted against age. The lines drawn in the figure and p values are based upon the regression parameters, as detailed in Materials and Methods and illustrated within Supplemental Table 1A. The absolute numbers of the CD4 CM and CD4 EM (Fig. 2C, 2D) cells also did not show changes in individuals of different age, and, as expected, numbers of CD4 EM cells remained particularly low in these CMV− subjects. However, unlike with the N CD8 T cells, the absolute numbers of the CD4 N T cells also did not show alterations in individuals of different ages (Fig. 2B), and high levels of N CD4 T cells were maintained in the old, as well as in the adult, subjects. Again, these results obtained on fresh PBMC were closely mirrored by data from cryopreserved PBMC samples (Supplemental Fig. 1). All regression calculations and extended data are provided in Supplemental Table 1. We next analyzed 239 CMV+ subjects and found similar patterns of cellular representation across ages, with declining percentages of N and increased percentages of memory cell subsets (data not shown). Importantly, CMV+ individuals showed an absolute increase in the EM CD4+ and CD8+ cells, with an estimated average of 67 (67.2) EM CD8+ cells/μl blood at 21 y, and 110 (109.65) EM CD8+ cells/μl at 80 y in CMV+ subjects, compared with 38 (38.3) EM CD8+ cells/μl at 21 and 24 (24.15) EM CD8+ cells/μl at 80 y for CMV− subjects. Although we clearly do not know the time of infection in our subjects, the differences between CD8+ EM cells in CMV+ and CMV− subjects (67 versus 38 cells/μl) were evident already at 21 y of age, suggesting that CMV causes inflation of the EM compartment promptly postinfection even in young subjects, consistent with the published literature (20, 25–27). The EM CD4+ T cells were almost twice as numerous in 80 y old in the presence of CMV compared with 21 y old (15 cells/μl at 21 and 28 cells/μl at 80 y; Fig. 3D), consistent with previous observations by Chidrawar et al. (20). Inflation of EM CD8 and CD4 cells in CMV+ subjects with age. Methodology, analysis, and panels are identical to Fig. 2, except that n = 239 individuals ranging in age from 21 to 96 and seropositive for CMV were analyzed. The lines drawn in the figure and p values are based upon the regression parameters as detailed in Materials and Methods and illustrated within Supplemental Table 1. CMV infection did not alter the rate of N CD8+ T cell loss seen with aging alone. CMV+ subjects had an estimated average of 238 (238.1) N CD8+ cells/μl blood at 21 and 21 (21.1) N CD8+ cells/μl at 80 y (Fig. 3B). This was not significantly different from the CMV− group (200 N CD8+ cells/μl blood at 21 y, and 24 N CD8+ cells/μl at 80 y; Fig. 2), and the slopes between the two regression lines were not significantly different (p = 0.14). The same results held with frozen PBMC (Supplemental Fig. 1). It could be argued that CMV is not unique in its ability to drive the above changes in the T cell pool and that other herpesviruses, or for that matter other persistent infections, could lead to similar changes. We examined the potential impact of two other herpesviruses upon our conclusions, HSV-1 and EBV. In our cohort, we could see no effect of HSV upon N, CM, or EM subset abundance (Supplemental Fig. 2), even though CMV+ subjects had a much greater (3.4-fold) probability of being HSV+. We could not formally evaluate the impact of EBV, because 93.5% of our cohort was EBV+ and we therefore had no cohort power to address this question. However, we can conclude that it was unlikely that EBV played any role in the results obtained, because EBV+, CMV− subjects exhibited much lower EM numbers with aging (and no accumulation of this subset) compared with EBV+ CMV+ subjects. Therefore, we conclude that the other two herpesviruses surveyed do not impact the EM pool abundance to the same level (if at all) as CMV. The CD4/CD8 ratio was proposed to be one of the components of the immune risk profile in the original studies by Wikby, Pawelec, and colleagues (24), and the inversion of that ratio correlated with an increased risk of mortality in older adults exhibiting the inversion. Our studies were not longitudinal and did not follow individual mortality. However, on a cohort level, we found this ratio to be affected by age, although in an unexpected manner (Supplemental Fig. 3). Namely, in CMV− individuals, the CD4/CD8 ratios did not decrease with age. This is in contrast to reports that show an age-associated decline in the CD4/CD8 ratio (reviewed in Ref. 24) but is consistent with other studies finding no such changes with aging (27–29). In fact, we saw an increase in the CD4/CD8 ratio with age, driven primarily by the loss of N CD8 T cells. Examination of the CMV+ subjects also revealed no significant decrease in the CD4/CD8 ratios with age (Supplemental Fig. 3A), although it appeared that more individuals over the age of 65 exhibited lower CD4/CD8 ratios. Analysis of frozen/thawed PBMC confirmed the above findings (Supplemental Fig. 3B). We are currently in the process of longitudinally following these individuals. Analysis of N CD4 T cell numbers suggested that CMV infection may precipitate a mild loss of these cells with aging (p = 0.028); moreover, absolute numbers of CD4 T cells appeared to be lower in CMV-infected individuals compared with CMV-negative subjects at all ages (even in young individuals), but the results did not reach statistical significance due to enormous variability. The issue of relationship between N CD4 T cells and CMV will require further study in longitudinal cohorts. The above results posed a question as to why other authors (19–21) may have not observed some of the results described above, most notably the loss of N T cells irrespective of CMV and the increase in EM but not CM cell pool, which grew more pronounced with age. Some of the reasons were rather obvious, for example, Looney et al. (19) have used a single marker, CD28, which was the key obstacle in properly delineating CM and N cells from one another. Therefore, in searching for possible underlying causes for discrepant conclusions, we considered both the cohort size effects and the differences in the phenotypic definition of T cell subsets. Given that our cohort was 3–10 times larger than those used in prior reports, we next explored the effect of cohort size. We first compared how the cohort size impacts on the conclusions that N CD8+ T cells decline with aging independently of CMV (one of the points of difference between our conclusions and those of other three studies). We reduced the cohort size to test how this may affect the conclusions and evaluated the correlation between N T cell numbers and age. Fig. 4A shows that in the entire cohort (391 subjects) N T cells decline with age regardless of CMV status (no difference between the slopes in CMV− and CMV+ subjects). However, when we randomly selected 40 plus 40 subjects (not weighting for variability, but approximating the cohort size used in past reports and spanning the entire age spectrum) (20, 21), statistical analysis suggested that CMV increased the N CD8 T cell loss (Fig. 4B); that effect was lost when we increased cohort size in a weighted fashion to account for the increased variability of the N T cell pools we observed in younger subjects (increasing the number of adults and CMV+ subjects to bring the sample size to 120, with n = 73 CMV+ and 47 CMV−) (Fig. 4C). We next conducted a simulation study to understand cohort size effect/small sample behavior in a more systematic manner. We randomly selected subsample size of 80 individuals (40 CMV+ and 40 CMV+) from the whole cohort (n = 391) and repeated regression analysis to see whether the subset analysis can reproduce the result from the whole cohort analysis. We repeated this 100 times (Table II). As stated above, using the whole cohort (n = 391), we observed no significant difference in slope between CMV+ and CMV− individuals (see Figs. 2B, 3B and the text above) and have concluded that CMV does not palpably impact the numerical loss of N CD8 T cells, which occurs as a consequence of aging. With 100 randomly selected subset of 80 individuals each, 13 of 100 subsample sets resulted in a statistically significant difference in N CD8 cell regression slopes between CMV+ and CMV− groups. Therefore, the false-positive rate was 13% with the subsample size of 80 (Table II, top). The false-positive rate decreased to 6% when we increased the subsample size to 120 (using weighed addition of CMV− and CMV+ individuals to match the group variability). Results were even more striking when evaluating the CD8 EM counts (Table II, bottom). Analysis of the entire cohort of 152 CMV− and 239 CMV+ individuals showed statistically different regression slopes (Figs. 2D, 3D) between the CMV− and CMV+ groups, confirming inflation of the EM compartment in the presence of CMV. However, 74 of 100 subsample sets of 80 individuals showed no such statistical significance, presenting a false-negative rate of a whopping 74% (equivalent to a mere 26% power to detect differences with this cohort size). This false-negative rate was reduced to a lower but still utterly unacceptably high false-negative rate (52%) when another 40 subjects were added. This powerfully illustrates the dangers of undersampling and leads us to conclude that the most likely explanation for the disparate conclusions in the literature lies in undersampling/underpowering of the cohorts in question by other studies. Cohort size considerations. PBMC from the entire cohort (n = 391) [239 CMV+, gray closed squares; 152 CMV−, black open squares (A)] or its subsets of 80 [40 CMV+ and 40 CMV− donors (B)] or 120 [80 + another 40 weighed; total 73 CMV+ and 47 CMV− (C)] individuals were analyzed for the possible impact of CMV upon the decline of N T cells plotted against age. Note the changes in significance (p value by regression analysis) as a consequence of cohort size. To insure that our conclusions were not biased by inappropriately chosen differentiation markers, we reanalyzed our data using other recommended markers (reviewed in Refs. 28 and 29). Figs. 5 and 6 show superimposed analysis of N T cell subsets in CMV− subjects defined by CD28int95low (phenotype definition 1) or CCR7highCD45RAhigh (phenotype definition 2) phenotypes for different subsets of subjects chosen from our cohort using a weighed method. Fig. 5 provides gating strategies and superimposition of one N, CM, EM definition (Fig. 5A, primary definition CD28/95; Fig. 5B, primary definition CD45RA/CCR7) onto the other for both CD4 and CD8 T cells in a representative subject. Fig. 6 then analyzed to what extent these definitions correspond to one another in a larger cohort of subjects for both CD4 and CD8 cells, by comparing concordance between N (Fig. 6A, 6C) and EM (Fig. 6B, 6D) numbers. This was done separately for N T cells defined by our original (CD28int95low) N definition (Fig. 6A, 6B for CD4 and CD8 T cells, respectively) and another accepted phenotypic definition of N cells (CCR7highCD45RAhigh); and also for EM cells defined by our original (CD28low95high) EM definition (Fig. 6C, 6D for CD4 and CD8 T cells, respectively) and another accepted phenotypic definition of EM cells (conventional [CCR7−CD45RAlow] + CD45RA–re-expressing [T effector memory cells reexpressing CD45RA] CCR7−CD45RAhigh). In each case, we saw an outstanding correlation between them for both CD4 and CD8 T cells (Fig. 6A–D). Multicolor FCM gating strategy (A, B). 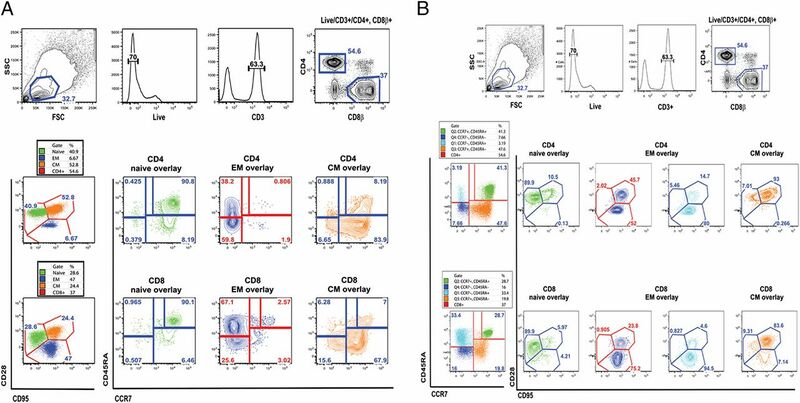 Representative flow cytometric analysis of one donor demonstrating gating to identify T cell subset populations (N, CM, and EM) and their respective overlaps between phenotypic gating strategy [CD28/95 primary gate (A) versus CD45RA/CCR7 primary gate (B)]. Color coding is as follows: green = N cells, orange = CM cells, blue (dark and light blue) = EM and terminal EM, respectively. Impact of phenotyping marker selection. Multiple surface marker definitions confirm fluctuations of N and EM T cells with age and CMV, respectively. Frozen PBMC from a weighted subset of our cohort, consisting of a total of 116 individuals, comprised of CMV− (n = 45) and CMV+ (n = 71) donors, were thawed, rested overnight, and phenotyped by multicolor FCM, as in Materials and Methods. A total of ≥3 × 105 events was analyzed, gated via the lymphocyte forward/size scatter gate, then on live cells, then with the main T cell subsets defined as CD3+CD4+ or CD3+CD8β+, and the N cells defined as CD28int95low or CD45RAhighCCR7high. Correlation between absolute numbers for N [(A) CD4 and (C) CD8] and EM [(B) CD4 and (D) CD8] cells defined as CD28int95low (phenotype 1, closed circles) and CD45RA+CCR7+ (phenotype 2, open circles) for the N and CD28high95high (phenotype 1, closed circles) and CD45RA+ or CD45RA− CCR7− (phenotype 2, open circles) for the EM is shown. The p values of R2 from regression concordance are all highly significant. (E, F) Corroboration of EM changes using CD57. The same cohort was analyzed by gating on CD3+CD4+ (open circles) or CD3+CD8+ (gray closed circles) cells to enumerate CD95+, CD45RA+, or CD45RA− CD28− CD57+ EM cells. The analysis shows that this cell type accumulates solely in the presence of CMV infection (F) but not its absence (E). ***p < 0.0001. To ensure that these results were further robustly validated, we have assessed whether the two phenotypic definitions similarly quantified N and EM cell abundance in each subject, using the Bland-Altman comparison of methods (30). The Bland-Altman analysis compares the agreement between two different assays or approaches, essentially testing whether the two different assays or methods are comparable across different magnitudes of data. This analysis (data not shown) demonstrated that for N CD8 cells, the two phenotypes were within ±2 SD of being superimposable. Concordance was high for other subsets as well, although for CD4 N and CD4 EM cells there was a tendency of phenotype 1 to score fewer cells than phenotype 2. FCM overlays (Fig. 5) demonstrated that this overestimation occurs because both EM and T effector memory cells reexpressing CD45RA subsets as defined by CD45RA and CCR7 (CCR7− fraction) contain subsets (5–25%) of CD28high95high cells that probably belong to memory populations that are more differentiated than conventional CM cells and most likely represent transitional cells between CM and EM (4). Importantly, however, none of these relationships changed at either high or low abundance of either N or EM cells. Overall, this further suggested that the two phenotypic definitions were concordant over a large span of parametric values. Finally, we have also used CD57 (22, 31) as an additional marker of highly differentiated EM cells, finding a very strong (p < 0.0001) significance that the CD57+ (gated via CD8 or CD4 and also CD45RA+ or CD45RA−, CD95highCD28low population) EM cells only exist in the CMV+ CD4 and CD8 memory compartment but not in the CMV− CD4 and CD8 memory compartment (Fig. 6E, 6F). For example, mean ± SEM of CMV+ CD4+CD57+:EM cells was 21.44 ± 3.684 (n = 69; Fig. 6F) as opposed to 0.5282 ± 0.1446 (n = 45; Fig. 6E) in CMV− subjects. Therefore, regardless of the precise marker sets used for definition of N or EM cells, aging and CMV resulted in specific, largely nonoverlapping patterns of T cell pool changes, the former leading to loss of N cells and the latter to accumulation of EM cells. Bulk analysis of the data shown in Figs. 1–3 did not reveal a clear interaction between CMV infection and aging with regard to T cell subset homeostasis. Activation status of CMV-specific T cells suggests that hCMV undergoes reactivation throughout the lifespan. However, subtle in vivo reactivation of CMV in humans has been exceptionally difficult to detect by virological methods in the absence of manifest immune suppression or additional comorbidity (32). Anti-CMV Ab titers have been used to describe the activity of the host immune system against hCMV (32), with high titers of anti-CMV Ab being taken as a correlate of the propensity of CMV to frequently reactivate and the inability of the immune system (perhaps CD8 T cells) to control such reactivation (32, 33). We sought to test whether Ab levels correlated with the age and abundance of T cell subsets in our subject cohort. To preserve statistical power, we divided all subjects into the upper and lower titer half, with the median titer being 349 (limit of detection = 10; maximal titer 1731). We compared the absolute counts of T cell subsets in CMV− subjects belonging to the three age groups (21–40; 50–64; 65 and older) to the age-matched subjects with high (>349 titer) and low (<349) Ab titers. We found (Fig. 7A) that CD8 EM T cell counts in younger adult group remained relatively flat regardless of the CMV titer. By contrast, in the two older groups, CD8 EM T cell counts were significantly higher in CMVAb+ individuals (Fig. 7B, 7C). Whereas there was a trend of higher inflation of EM CD8 T cells in the >65 group compared with those between 50 and 64 y of age, that trend was not statistically significant. When analyzed across age groups, N CD8 T cell numbers were not influenced by anti-CMV Ab titers; they declined with age with the same slope for all three groups (Fig. 7D). 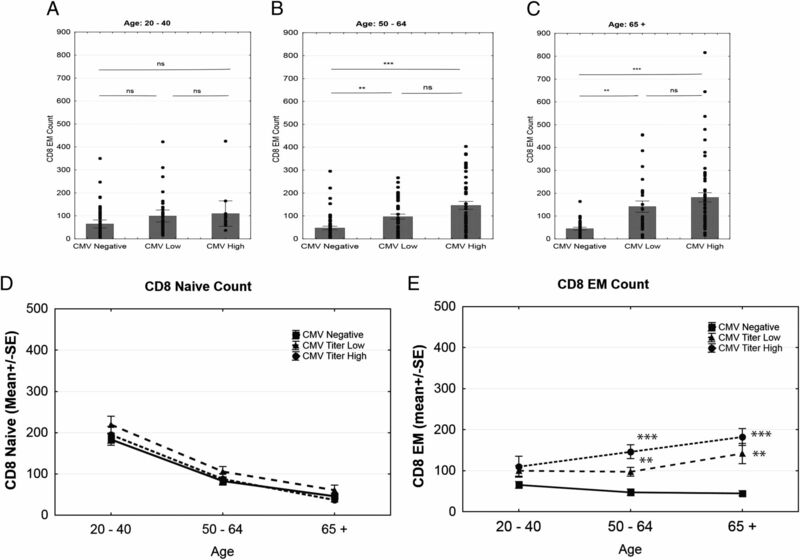 By contrast, in the CMV Abhigh individuals, the older groups exhibited more pronounced accumulation of CD8 EM cells compared with younger cohorts (Fig. 7E). Overall, CD8 EM cells were the only CD8 subset that showed interaction between CMV and aging (Fig. 7E). The analysis of CD4 subsets did not show significant changes with anti-CMV Ab titer (data not shown). CD8 EM expansion is dependent upon CMV titer and age. Results shown in Figs. 2 and 3 were plotted against anti-CMV Ab titers by separating the cohort (n = 391) into upper and lower anti-CMV Ab titer half (lower < 349 > upper); multiple regression model with age and CMV status as covariates was used to calculate significance. CD8 EM numbers are shown for anti-CMV titer high, low, and CMV−: (A) for individuals 40 y and younger; (B) individuals 50–64 y of age; and (C) for individuals 65 y of age and older. (D) Slope of absolute N CD8 cell count over age groups. (E) Slope of absolute EM T cell inflation over age groups. Data from CMV−, CMVAblow, and CMVAbhigh subjects are shown in solid line/squares, dashed line/triangles, and dotted line/circles, respectively. Significance of **p = 0.01 to p = 0.001, ***p > 0.001 was determined by two-way ANOVA, followed by Bonferroni correction for multiple comparisons. Corroboration of the above data was obtained when we analyzed variation in cell numbers by the state of infection and age. Variability of N T cell number tended to decrease with aging. N T cell numbers appear to be more variable in younger subjects group compared with middle-aged and elderly group (Levene’s test p values were 0.0112 and <0.0001 for comparisons between young adult and 50–64 y old, and young adult and 65 and older, respectively; Fig. 8). Furthermore, there was significant difference in variability between 50- to 64-y and >65-y groups (p value = 0.0017), with those over 65 showing the least variability. The variability pattern of N cells did not significantly differ between the CMV− and CMV+ cohorts (Fig. 8A, 8D, 8G, Levene’s test p value = 0.0677; reduction of variability between age groups also shown in Fig. 9A), consistent with our conclusion that CMV does not massively influence the numbers of N T cells. EM cell variability in younger subjects was also not sensitive to CMV status (Levene’s test p value = 0.3529), despite the fact that even the younger adult CMV+ cohort exhibited significant increase in the absolute EM count (Bonferroni adjusted p value = 0.0138). By contrast, focused analysis of CD8 EM count variability in older age groups revealed striking differences between CMV− and CMV+ individuals with age. This was a consequence of several trends. First, whereas the variability was similar in younger and middle-aged individuals regardless of CMV infection (p = 02199), the older CMV− subjects showed reduced EM cell variability; by contrast, the older CMV+ subjects exhibited remarkably higher variability compared with CMV− subjects (Levene’s test p value = 0.0317 and 0.0049, for 50- to 64-y and >65-y age groups, respectively; Fig. 8B, 8E, 8H). Finally, the older groups exhibited more pronounced increase in absolute CD8 EM count (Bonferroni adjusted p value = 0.0001 for both the 50–64 and 65+ age groups). For comparison, the CMV+ younger adult group (<40) displayed 1.9 times higher CD8 EM count than that of comparable CMV− group, whereas the CMV+ cohort in the old group (65+) displayed 3.9 times higher CD8 EM count than that of CMV− cohort in the older group, and that difference was statistically significant (p value = 0.0168). Therefore, CMV was associated with marked individual variations that were more pronounced specifically in older adults (Fig. 8E, 8H), and that is also illustrated in Fig. 9B as a comparison between the three age groups. By contrast, age distribution variability was uniform between CMV+ and CMV− cohorts within each age group (Fig. 8C, 8F, 8I), demonstrating that within-cohort age variability cannot explain the observed results. Variance in absolute count is significantly increased in the inflated EM pool of CMV+ donors. Absolute T cell inflation within age bins from CMV− (open squares) and CMV+ (closed squares) subjects. Plots show the SD of absolute N (A, D, G) and EM (B, E, H) T cell counts. Overall n = 391; CMV+ = 239. CMV− = 152, and as noted within axis of each panel. (C, F, I) Illustrate that the CMV− and CMV+ cohorts are age matched within each age bin. Significance as noted within the panels. Variance in absolute count of naive pool declines with advancing age independent of CMV status; variance increases significantly in aged CMV+ donor subset. Plots show the SD of absolute N (A) and EM (B) T cell counts. n = 391; CMV+ = 239. CMV− = 152. Absolute T cell inflation over age from CMV− (dark line, open squares) and CMV+ (gray line, closed squares) subjects. In this study, we have investigated the role of aging in the absence or presence of CMV infection in modulating the balance of CD8 and CD4 T cell subsets in peripheral blood. Although it has been known that aging is accompanied by changes in T cell subset balance, only a handful of studies has evaluated the impact of aging upon the absolute numbers of T lymphocyte subsets while controlling for the role of CMV (19–21, 34). The study by Looney et al. (19) examined old (>60 y; mean age 72 for CMV− and 76 for CMV+) and young (<60; mean age 34.5 for CMV+ and 39.7 for CMV−) U.S. subjects. Despite several shortcomings (treating age as a binary category—old or young; using three-color FCM, with no precise distinction between N and CM subsets; assuming that all CD3 cells are either CD8 or CD4; using small numbers of CMV− subjects, 22 old and 26 young, per above age groupings), this seminal study established the emergence of a CD28−CD8+ (and CD28−CD4+) cell phenotype as a strong correlate of CMV infection that was independent of aging, suggesting that memory inflation (35, 36) occurs in humans. Chidrawar et al. (20) analyzed T cell subsets from 122 healthy U.K. donors, aged 20–40 (8 CMV+; 18 CMV−), 40–60 (12 CMV+; 10 CMV−), and >60 y (47 CMV+; 29 CMV−; oldest subjects >80 y old) by three-color FCM. These authors concluded that CMV led to an increase in CD8 memory pool, due to an increase in resting memory (CM) cells, a conclusion based on an incomplete and potentially misleading identification of CD45RA+ cells as CM. This study suggested that memory inflation occurs in both the CD8 and CD4 cells in the presence of CMV. The authors concluded that CMV reduces N CD8 T cells over and above the effects of aging, adding “40 years of age” to the effects seen in CMV− donors, but that conclusion was based upon relative, and not absolute, representation of N cells in 28 younger and 29 older CMV− subjects. As our studies show, limited cohort size is highly conducive to these types of errors (Fig. 4C). Litjens et al. (21) evaluated circulating T cell subsets in a Dutch cohort of young (20–40 y; 15 CMV− and 17 CMV+) and elderly (>60 y; 21 CMV− and 23 CMV+) subjects using six-color FCM, with an appropriate discrimination of cell subsets but with limited power. They found no significant decline in total CD8 or CD4 pools, regardless of CMV infection; the increase in CD8 memory subsets with CMV was observed but was not significant except for the CD8 CM cells and total memory cells (EM + CM + effector memory cells reexpressing CD45RA); and a decline in N CD4 and CD8 cells was found significant in CD8 cells regardless of CMV and was significant for CD4 cells only in the presence of CMV. Finally, the Wikby et al. study (34) was focused upon a small cohort of nonagenerians. Neither of the above studies (19–21, 34) was powered to dissect, and three of them (19, 20, 34) did not explicitly delineate, the effects of aging in the absence of CMV infection, which was the primary goal of our work. Our study used a large sample size of 152 CMV− subjects aged 21–101. We found that aging in the absence of the CMV infection led to both relative, and more importantly, absolute reduction in N CD8 cells, but, contrary to the prevailing views, did not lead to accumulation of CM or EM CD8 T cells, whose numbers remained stable or declined slowly (but not significantly within our statistical analysis) with aging. Therefore, physiological immune aging is accompanied by declining N and stable memory CD8 T cell pools. CD4 cells exhibited no significant relative or absolute changes in the N, CM, or EM cell pools. Reasons for this difference remain unclear, although CD8 T cells are known to undergo higher homeostatic turnover in nonhuman primates and humans compared with CD4 T cells (37, 38) and, when confronted with the same stimulus, proliferate faster and longer (reviewed in Ref. 39). It is possible that such differences may lead to higher rates of apoptosis and/or conversion into true or virtual memory cells (40, 41), leading to depletion of the truly N cell pool. We also note that the loss of N CD8 T cells was not linear with age, an issue that will require additional investigation. In CMV+ subjects, the loss of N CD8 cells was not exacerbated compared with CMV− subjects, suggesting that this virus does not grossly affect the abundance of circulating N CD8 T cells. We observed an absolute increase in EM (but not CM) pool in CMV+ subjects. Therefore, the main effect of CMV is to expand and increase the absolute size of the EM compartment, an effect that became more pronounced with aging, most likely due to the massive EM response to periodically produced viral Ags. CD4 N cells were somewhat reduced, whereas the CD4 CM T cell subsets did not show numerical changes in the presence of CMV. However, the minor CD4 EM subset doubled in the presence of CMV infection. We did not observe reduction or inversion of CD4/CD8 ratios in either CMV− or CMV+ subjects on a group level, and in fact we found that such ratios increase in CMV− subjects. This, however, does not address the value of the CD4/CD8 ratio as a biomarker of immune vitality or mortality risk (42). The above results can be integrated into a comprehensive picture of age- and frequent persistent pathogen-mediated changes in the circulating T cell pool. Attrition of circulating N CD8 T cells was the most profound age-related change, with a 10-fold reduction between 21 and 80 y of age. Yet, CMV infection does not further increase the loss of N CD8 cells. Similar conclusions were reached by the study of Vescovini et al. (43) in a different cohort of CMV+ subjects, in which the magnitude of the anti-CMV response correlated to the size of the EM pool, but not to age or to the loss of N cells. Correlation between CMV infection and impaired immune responsiveness has been reported in humans (44), but the ethical limits preclude direct investigation of the impact of these factors upon human immune defense. Mouse experiments with controlled CMV lifelong infection and direct testing of antimicrobial resistance recently (45⇓–47) provided results are fully consistent with the conclusions of our study and with Vescovini et al. (43), namely, that aging leads to decline in N CD8 cells and reduced TCR diversity, whereas CMV does not impact N cells but induces memory inflation of EM cells independent of, but eventually synergistic with, aging. We found a sizable number of aged CMV+ donors who did not experience memory inflation. This finding suggests that CMV is necessary but not sufficient for memory inflation even after age 65. Experiments are in progress to address what other factors may be involved in precipitating memory inflation in the old age. Although we did not observe the same extent of profound numerical changes in the CD4 T cell pool with aging as found in CD8+ T cells, the relatively preserved pool should not be equated with intact CD4 function. Indeed, previously described functional defects in CD4 cells (48) most likely impair immunity in their own right. Limitations of our study include the following: 1) cross-sectional design, which lacks a longitudinal component, and 2) implied assumption that time and course of CMV pathogen exposure were equal among subjects. Studies in progress now include longitudinal titers and assessments of CMV viral DNA in plasma, PBMC, and urine. Overall, our findings, those by Vescovini et al. (43), and the past literature (49⇓⇓–52) dictate that we move toward testing of predictive value of biomarkers defined in these studies. Specifically, vaccine responses should be studied prospectively with regard to the numbers, diversity, and functional reactivity of different T cell subsets, with the goal to stratify human populations to improve vaccine efficacy. We thank D. Wasserman, the Oregon Brain Aging Study, the National Institute on Aging–funded Oregon Alzheimer Disease Center, supported by P30 AG008017, and the Office of Research and Development, Clinical Sciences Research and Development Service, Department of Veterans Affairs, Portland Veterans Affairs Medical Center, for help with subject recruitment. We acknowledge Dr. S. Njoroge for subject recruitment and technical assistance, and the Clinical and Translational Research Center resource at Oregon Health and Science University and the Clinical and Translational Science Center at the University of Arizona for facilitating blood draws. We are deeply thankful to all of our study participants without whose continued participation this study would not have been possible. This work was supported by National Institutes of Health Contract HHSN 272201100017C (National Institutes of Health/National Institute of Allergy and Infectious Diseases N01-AI 00017) and the Bowman Trust (Endowed Professorship in Medical Research to J.N.-Ž.).
. 2003. Aging, Immunity and Infection. Humana Press, Totowa, NJ. 2000. Epidemiology and unique aspects of aging and infectious diseases. Clin. Infect. Dis. 30: 931–933.
. 2009. Vaccination in the elderly: an immunological perspective. Trends Immunol. 30: 351–359.
. 2004. Vaccines for women age 50 and older. Emerg. Infect. Dis. 10: 1990–1995.
. 2011. CD8+ T cell differentiation in the aging immune system: until the last clone standing. Curr. Opin. Immunol. 23: 549–554. 2008. Ageing and life-long maintenance of T-cell subsets in the face of latent persistent infections. Nat. Rev. Immunol. 8: 512–522.
. 2010. Loss of naive T cells and repertoire constriction predict poor response to vaccination in old primates. [Published erratum appears in 1994 Eur. J. Immunol. 24: 1949.] J. Immunol. 184: 6739–6745. Hengel, H., W. Brune, and U. H. Koszinowski. 1998. Immune evasion by cytomegalovirus–survival strategies of a highly adapted opportunist. Trends Microbiol. 6: 190–197.
. 2008. The immune system in extreme longevity. Exp. Gerontol. 43: 61–65. 1990. Categorical or indicator variables (regression models and ANOVA models). In Classical and Modern Regression with Applications. Myers R. M., ed. Duxbury Thomson Learning, Australia-Canada-Mexico-Singapore-Spain-United Kingdom-United States, p. 135–153.
. 2004. 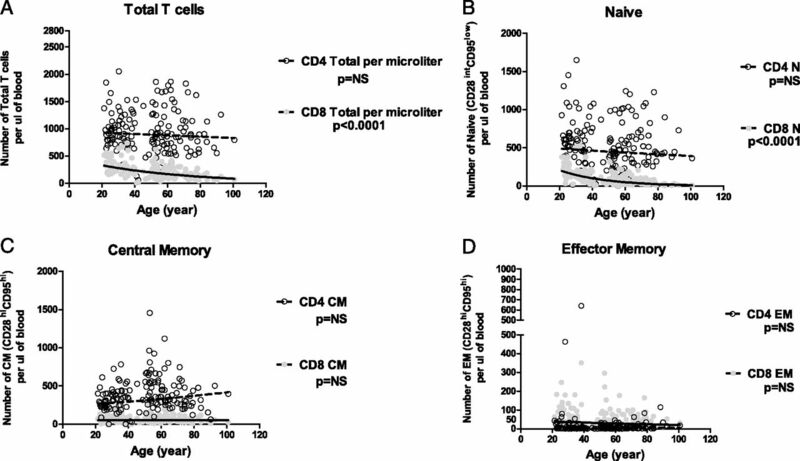 Characterization of naive, memory and effector CD8+ T cells: effect of age. Exp. Gerontol. 39: 545–550.
. 2005. Long-term cytomegalovirus infection leads to significant changes in the composition of the CD8+ T-cell repertoire, which may be the basis for an imbalance in the cytokine production profile in elderly persons. J. Virol. 79: 3675–3683.
. 2005. Age-related loss of naive T cells and dysregulation of T-cell/B-cell interactions in human lymph nodes. Immunology 114: 37–43.
. 2011. Cytomegalovirus infection induces the accumulation of short-lived, multifunctional CD4+CD45RA+CD27+ T cells: the potential involvement of interleukin-7 in this process. Immunology 132: 326–339.
. 2007. Immunosenescence of ageing. J. Pathol. 211: 144–156.
. 1999. Role of cytomegalovirus in the T cell changes seen in elderly individuals. Clin. Immunol. 90: 213–219.
. 2009. Cytomegalovirus-seropositivity has a profound influence on the magnitude of major lymphoid subsets within healthy individuals. Clin. Exp. Immunol. 155: 423–432.
. 2011. Differential effects of age, cytomegalovirus-seropositivity and end-stage renal disease (ESRD) on circulating T lymphocyte subsets. Immun. Ageing 8: 2.
. 1999. Distribution of human CMV-specific memory T cells among the CD8pos. subsets defined by CD57, CD27, and CD45 isoforms. Eur. J. Immunol. 29: 2908–2915.
. 2005. Human immunosenescence: is it infectious? Immunol. Rev. 205: 257–268.
. 2008. Dynamics of T cell memory in human cytomegalovirus infection. Med. Microbiol. Immunol. 197: 83–96.
. 2002. 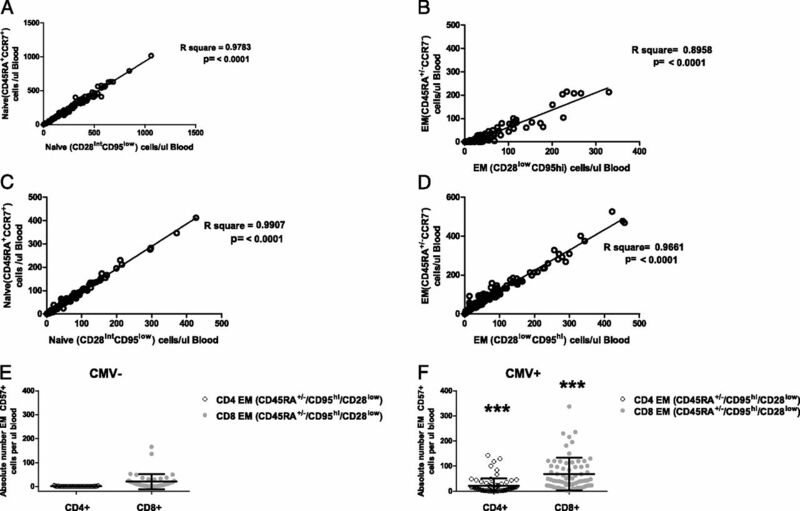 Identification of naive or antigen-experienced human CD8(+) T cells by expression of costimulation and chemokine receptors: analysis of the human cytomegalovirus-specific CD8(+) T cell response. J. Immunol. 168: 5455–5464.
. 2001. 11-color, 13-parameter flow cytometry: identification of human naive T cells by phenotype, function, and T-cell receptor diversity. Nat. Med. 7: 245–248.
. 2012. New tools for classification and monitoring of autoimmune diseases. Nat. Rev. Rheumatol. 8: 317–328.
. 1986. Statistical methods for assessing agreement between two methods of clinical measurement. Lancet 1: 307–310.
. 2007. Chronic herpesvirus reactivation occurs in aging. Exp. Gerontol. 42: 563–570.
. 2010. Intense antiextracellular adaptive immune response to human cytomegalovirus in very old subjects with impaired health and cognitive and functional status. J. Immunol. 184: 3242–3249.
. 2002. Expansions of peripheral blood CD8 T-lymphocyte subpopulations and an association with cytomegalovirus seropositivity in the elderly: the Swedish NONA immune study. Exp. Gerontol. 37: 445–453.
. 1998. Control of murine cytomegalovirus in the lungs: relative but not absolute immunodominance of the immediate-early 1 nonapeptide during the antiviral cytolytic T-lymphocyte response in pulmonary infiltrates. J. Virol. 72: 7201–7212.
. 2009. The antigen-specific CD8+ T cell repertoire in unimmunized mice includes memory phenotype cells bearing markers of homeostatic expansion. J. Exp. Med. 206: 435–448.
. 2005. An immune risk phenotype, cognitive impairment, and survival in very late life: impact of allostatic load in Swedish octogenarian and nonagenarian humans. J. Gerontol. A Biol. Sci. Med. Sci. 60: 556–565.
. 2013. Naïve and memory CD8 T cell pool homeostasis in advanced aging: impact of age and of antigen-specific responses to cytomegalovirus. Age (Dordr.) In press.
. 2004. Herpesvirus-specific CD8 T cell immunity in old age: cytomegalovirus impairs the response to a coresident EBV infection. J. Immunol. 173: 7481–7489.
. 2012. Cytomegalovirus infection impairs immune responses and accentuates T-cell pool changes observed in mice with aging. PLoS Pathog. 8: e1002849.
. 2012. Immune senescence: relative contributions of age and cytomegalovirus infection. PLoS Pathog. 8: e1002850.
. 2012. Lifelong persistent viral infection alters the naive T cell pool, impairing CD8 T cell immunity in late life. J. Immunol. 189: 5356–5366. Goronzy, J. J., and C. M. Weyand. 2003. Aging, autoimmunity and arthritis: T-cell senescence and contraction of T-cell repertoire diversity - catalysts of autoimmunity and chronic inflammation. Arthritis Res. Ther. 5: 225-234.
. 2000. Shortage of circulating naive CD8(+) T cells provides new insights on immunodeficiency in aging. Blood 95: 2860–2868.
. 2005. Dysregulation of T-cell function in the elderly: scientific basis and clinical implications. Drugs Aging 22: 589–603.
. 2002. Lack of antibody production following immunization in old age: association with CD8(+)CD28(−) T cell clonal expansions and an imbalance in the production of Th1 and Th2 cytokines. J. Immunol. 168: 5893–5899.
. 2003. Age-associated accumulation of CMV-specific CD8+ T cells expressing the inhibitory killer cell lectin-like receptor G1 (KLRG1). Exp. Gerontol. 38: 911–920.